For the minor league ballpark in Boise, Idaho, see Airway Park. Braves Field was a baseball park in the Northeastern United States, located in Boston. Today the site is home to Nickerson Field on the campus of Boston University. The stadium was home of the Boston Braves of the National League from 1915–1952, prior to the Braves' move to Milwaukee in 1953. The stadium hosted the 1936 Major League Baseball All-Star Game, the 1915 and 1916 World Series home games for the Boston Red Sox, and the 1948 World Series. Braves Field was the site of Babe Ruth's final season, playing for the Braves in 1935. From 1929 to 1932, the Boston Red Sox played select regular season games periodically at Braves Field. On May 1, 1926, Braves Field hosted the longest baseball game in history – 26 Innings. The game ended in a 1-1 tie. Braves Field was also home to multiple professional football teams between 1929 and 1948, including the first home of the National Football League (NFL) franchise that became the Washington Redskins. The pro football Braves played at the ballpark in their inaugural season of 1932, then were at Fenway Park for four seasons as the Boston Redskins before the move south in 1937 to Griffith Stadium in Washington, D.C. Located on Commonwealth Avenue at Babcock Street, the baseball field was aligned northeast, much as the Red Sox' home, Fenway Park has been since it opened in April 1912. Most of the stadium was demolished in 1955, but significant portions of the original structure still stand and make up part of the Nickerson Field sports complex on the campus of Boston University. While built for baseball and having a rich baseball history, Braves Field briefly served as host for football teams. Braves Field was one of two homes (with Fenway Park) of the Boston Bulldogs of the first American Football League (in 1926) and the Boston Shamrocks of the second AFL (in 1936 and 1937). The National Football League's Pottsville Maroons were sold and relocated to Braves Field in 1929 as the Boston Bulldogs. In 1932, Braves Field became home of the football Boston Braves, a National Football League expansion franchise, owned by George Preston Marshall. The next year, after a 4-4-2 season, the Boston Braves Football franchise moved to Fenway Park and changed its name to the Redskins. In 1937 the franchise relocated and become today's Washington Redskins. Later, the Boston Yanks played a few games at Braves Field when Fenway Park was unavailable. 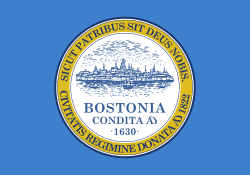 Before the Braves became the first modern-era franchise to relocate, in 1952, the Boston Braves franchise had been in Boston since 1871. 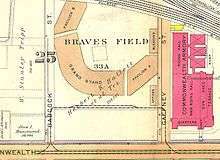 Before Braves Field, the franchise had played at South End Grounds, with play at Congress Street Grounds in 1894 while South End Grounds was rebuilt following the May 5, 1894 Roxbury Fire . Shortly after the Boston Red Sox opened Fenway Park in 1912, Braves owner James Gaffney purchased the former Allston Golf Club, one mile west of Fenway Park to build a new park for the Braves. Construction of the $600,000 Braves Field began on March 20, 1915 and was completed before the end of the 1915 season. The park was constructed entirely of steel (approx 750 tons) and an estimated 8 million pounds of concrete. Braves Field officially opened on August 18, 1915 with 46,000 in attendance to see the Braves defeat the St. Louis Cardinals 3-1. Braves Park was the largest stadium built in that era, with 40,000 capacity and a trolley system leading to the park. Braves Field was nicknamed The Wigwam by fans. Later it was nicknamed The Bee Hive and the name changed to National League Park,from 1936–1941, a period during which the owners changed the nickname of the team to the Boston Bees. The renaming of the team and stadium were both eventually dropped. During this span, it hosted the fourth Major League Baseball All-Star Game in 1936. With its capacity to hold more fans than Fenway Park, Braves Field was used by the Red Sox in the 1915 and 1916 World Series; with Braves Field still under construction, the Braves had used Fenway Park for their World Series Title in 1914. Postcard showing the lights shortly after installation in 1946/47. Looking at design, James Gaffney, wanted to see the game played in a wide open field conducive to allowing numerous inside-the-park home runs. 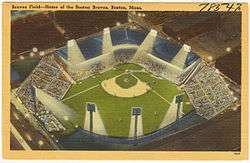 Thus, the stadium was built in what was, at the time, the outskirts of Boston, in a large rectangular plot, contrasting with the cozy and lopsided block containing Fenway Park. The stands were almost entirely in foul territory, leaving little in the outfield to which players could hit a home run into – with the fences over 400 feet (120 m) away down the lines and nearly 500 feet (150 m) to dead center, hitting the ball over the outer fences was all but impossible during the dead-ball era. A stiff breeze coming in from center field across the Charles River further lessened any chances of seeing home runs fly out of the park. The only possible target in the outfield was a small bleacher section, which came to be known as The Jury Box after a sportswriter noticed during one slow mid-week game that there were only twelve individuals sitting in the 2,000-seat stand. Ty Cobb visited the park and commented, "Nobody will ever hit a ball out of this park." The large foul ground area further favored the pitchers. It took seven years and a livelier ball before a batter hit a home run that cleared the outer wall on the fly. New York Giants catcher, Frank Snyder, hit the first major league home run in the history of Braves Field in 1922 when he cleared the left field foul pole. Meanwhile, it remained a pitchers' park, perhaps never more so than on May 1, 1920, when Brooklyn Dodgers pitcher Leon Cadore and Braves pitcher Joe Oeschger locked horns for a pair of complete-game performances that went on for a still-record 26 innings. After all that work, the game ended in a 1-1 tie, called on account of darkness. At the advent of the lively ball era, it became clear that the fans were unhappy with Gaffney's vision of how baseball should be played, and inner fences were built, and regularly moved, being moved in and out based on whims. Later, the ownership of the team even went so far as to shift the entire field in a clockwise direction (towards right field) at one point. One year after opening Braves Field, Gaffney had sold the Braves, but kept Braves Field. Gaffney and his heirs then leased the stadium out to Braves owners until 1949, when his heirs sold it back to the Braves for approx. $750,000. On Sunday, September 21, 1952, the Brooklyn Dodgers defeated the Braves 8-2 before 8,822 fans in the final Major League game at Braves Field. Roy Campanella hit the last home run to help Joe Black defeat a Braves team with 20 year-old rookie Eddie Mathews hitting 3rd. 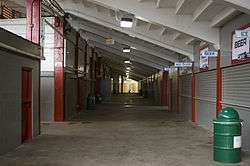 The concourse under the ballpark's remaining seating area still exists almost exactly as it did when the Braves played there. After purchasing the Braves from Bob Quinn in 1945, owner Lou Perini, citing low attendance, moved the Braves to Milwaukee just prior to the 1953 season, leaving Braves Field vacant. The Braves had drawn less than 300,000 fans in 1952, after drawing over 1 million in 1947,1948 and 1949. Milwaukee had been the site of the Braves' Minor League team, the Milwaukee Brewers, and the Braves had earlier blocked an attempt by the St. Louis Browns to move to Milwaukee. With the Braves gone, Boston University quickly purchased the former home of the Braves on July 30, 1953, renaming it Boston University Field and utilizing it for their student athletes, a usage that remains today. The remaining scoreboard was sold and was moved to Kansas City Municipal Stadium. The old ballpark was used as-is until 1955, when Boston University reconfigured the stands and the grounds. The remodel, replaced all but the pavilion grandstand at the end of the right field line, which was retained as the seating core of a football, soccer, field hockey, and track-and-field stadium. The stadium was initially called "Boston University Field" and later renamed Nickerson Field. Along with the pavilion, the original outer wall was retained, though a portion of that wall along what is now Harry Agganis Way was replaced with wrought iron fencing in 2008. The stadium's ticket office was converted into the Boston University police station. The rest of the stadium structure was replaced by dormitories covering the former main grandstand; and the Case Physical Education Center, which houses Walter Brown Arena and Case Gym in the vicinity of what was the left field pavilion along Babcock Street. Of the demolished Jewel Box ballparks, Braves Field has the largest proportion of visible remnants still standing, as no other former ballpark has any portion of its seating still in use. World Series games were played at Braves Field in 1915, 1916, and 1948. The Boston Red Sox played their home games in the 1915 and 1916 World Series at the new Braves Field, as its capacity at the time was larger than Fenway Park, while the Braves hosted three games of the 1948 World Series. The Red Sox defeated the Philadelphia Phillies 4 games to 1 to win the 1915 World Series. On Monday, October 11, the Red Sox won Game 3 at Braves Field 2-1 in front of 42,300. The next day, the Red Sox won Game 4 in front of 41,096, also 2-1. As a young pitcher on the Red Sox, Babe Ruth only appeared in the series once, as a pinch hitter, going 0-1 in Game 1. The following year, the Red Sox played the Brooklyn Robins in the 1916 World Series. 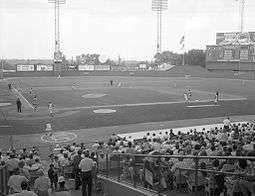 In Game 1, the Red Sox defeated Brooklyn 6-5 at Braves Field in front of 36,117. On Monday, October 9, Boston left-hander Babe Ruth pitched against Sherry Smith in front of 47,373. Ruth and Smith dueled for 14 innings, before Ruth and the Red Sox won in the bottom of the 14th 2-1. The Red Sox won their second consecutive World Series with a 4-1 victory in Game 5 at Braves Field, with 43,620 in attendance. In 1948, the Boston Braves captured the National League pennant with 91 wins. The Braves then played the Cleveland Indians in the World Series, losing 4 games to 2. Two future Hall-of-Famers led their teams as Managers, Lou Boudreau of Indians and Billy Southworth leading the Braves. 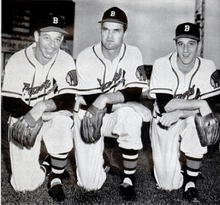 The 1948 Braves were led by pitchers Johnny Sain and Hall-of-Famer Warren Spahn. In Game 1, on October 6, Sain beat Bob Feller of the Indians 1-0 at Braves Field in front of 40,135. The Indians took Game 2 4-1, the next day at Braves Field, with Bob Lemon beating Spahn with 39,633 in attendance. Game 2 also made television history when a live broadcast of the game was shown to passengers of the B&O Railroad's train traveling between Washington, D.C. and New York City. The Braves and Indians returned to Boston for Game 6 on Monday October 11, 1948. The Indians defeated the Braves 4-3 in front of 40,103 to capture the championship. On July 7, 1936 the 1936 Major League Baseball All-Star Game was played at Braves Field, with 25,566 in attendance. The National League defeated the American League 4-3 in the 4th All-Star game, featuring over 20 future Major League Baseball Hall of Fame members. Lefty Grove and Dizzy Dean were the starting pitchers for managers Joe McCarthy of the New York Yankees and Charlie Grimm of the Chicago Cubs. Lou Gehrig hit a home run for the American League, batting behind rookie Joe DiMaggio in the lineup. Among others, Luke Appling, Bill Dickey, Joe Cronin, Schoolboy Rowe, Jimmie Foxx, Rick Ferrell, Earl Averill and Charlie Gehringer were selected for the American League. The National League roster included Billy Herman, Joe Medwick, Gabby Hartnett, Arky Vaughn, Goose Goslin, Leo Durocher, Ernie Lombardi, Mel Ott and carl Hubbell. On Saturday, May 1, 1920, at Braves Field, the Boston Braves and Brooklyn Robins played 26 complete innings in a game that ended in a 1-1 tie, called due to darkness by Home Plate Umpire Barry McCormick. The longest Innings game in Major League history. Starting pitchers, Leon Cadore (Brooklyn) and Joe Oeschger (Boston), both pitched the entire game in front of 4,500 fans. The 26 innings by both pitchers set an unbroken record and it is estimated conservatively that each threw at least 300 pitches. Oeschager threw 21 consecutive scoreless innings in the game, Cadore threw 20. Second baseman Charlie Pick of the Braves went 0-11, the worst single day at the plate in MLB history. Cadore faced 95 Braves hitters, while Oeschager faced 90 hitters. Brooklyn and the Braves met again on Monday, May 3, after an off-day for the Braves. That game lasted another 19 Innings, a 2-1 Boston win. In between, on Sunday, May 2, Brooklyn played at home against Philadelphia (4-3 Brooklyn win) in a game that went 13 innings. This gave Brooklyn 58 Innings in 3 days and 3 games. June 16, 1916—Tom Hughes, 2-0 vs Pittsburgh Pirates. Attendance: N/A. April 27, 1944—Jim Tobin, 2-0 vs Brooklyn Dodgers. Attendance: N/A. August 11, 1950—Vern Bickford, 7-0 vs Brooklyn Dodgers. Attendance: 29,208. May 6, 1951—Cliff Chambers, Pittsburgh 3-0 vs Boston Braves, 2nd Game of Doubleheader. Attendance:15,492. There were only two 3-HR games at Braves Field. Jim Tobin, Braves. May 13, 1942 vs Chicago Cubs. Braves won 6-5. Attendance: 3,443. Tobin is the only Modern Era pitcher to hit 3 Home Runs in one game. As noted above the fences were moved repeatedly throughout the ballpark's existence, sometimes within a given season. Wikimedia Commons has media related to Braves Field. 1 2 3 Frank, Stanley (July 1947). Diamonds Are Rough All Over. Baseball Digest. Retrieved 24 February 2012. ↑ Lowry, Philip (2006). Green Cathedrals. Walker & Company. p. 33. ISBN 978-0-8027-1608-8.